From Pushkar, we traveled to historic Jaipur. 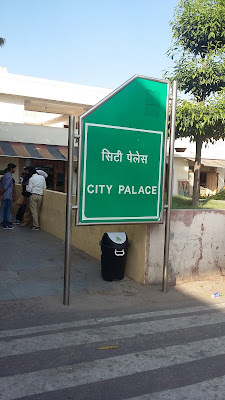 After checking in at our hotel, we relaxed for an hour and then we were ready for our visit to Birla Mandir. Most of us ladies grabbed at the opportunity of draping ourselves in shimmering silk sarees. At the foot of Moti Dungri fort is the Lakshminarayan Temple, also known as Birla Mandir. One of the major attractions of Jaipur, Birla Mandir looks stunning, specially when brightly lit in the night. Inaugurated on 22nd February 1985, Birla Mandir has been constructed with the finest quality of white marble. The three huge domes of the temple represent three different approaches to the religion. We have Lord Ganesha's figure carved above the entrance. The images of Lakshmi and Narayan attract the attention, being made out from one piece of marble. The fascinating exteriors of the temple are carved splendidly with beautiful sculptures based on mythological themes, while the interiors have a large marble panel portraying mythological events. The Laxmi Narayan Mandir is a modern architectural marvel, surrounded by lush green gardens. We returned to our hotel, enjoyed dinner and retired for the night. 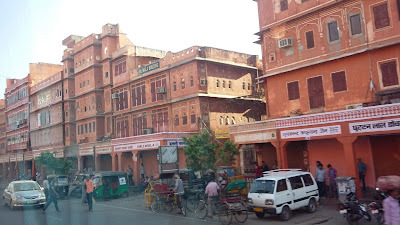 After a good night's sleep, and a yummy breakfast next morning, we were set to explore the Pink City. As we were driving to our first destination, we saw the section of the city where all buildings are pink - true to the epithet attributed to Jaipur. 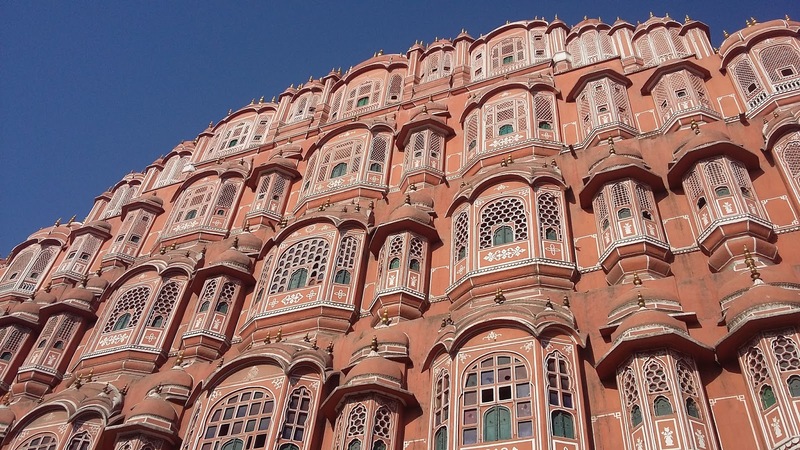 How excited we were to see the iconic Hawa Mahal located bang in the heart of the city of Jaipur! 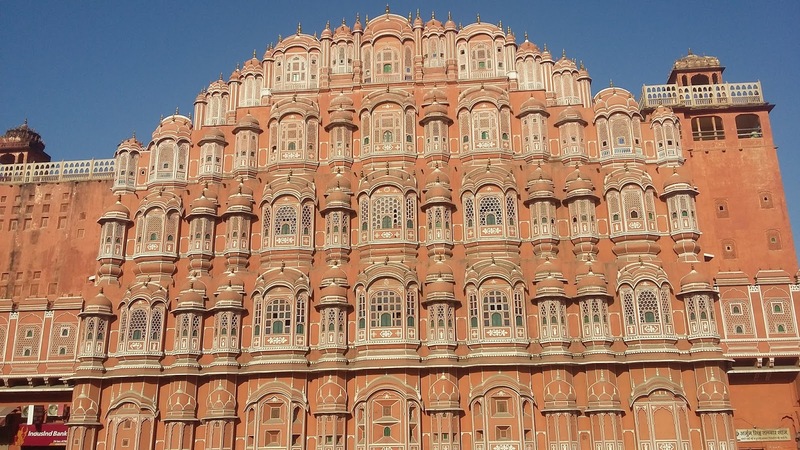 Built in red and pink colored sand stone, in keeping with the decor of the other monuments in the city, its color is a full testimony to the epithet of "Pink City" given to Jaipur. We reached the place early enough (8.20 am) before the office traffic started. 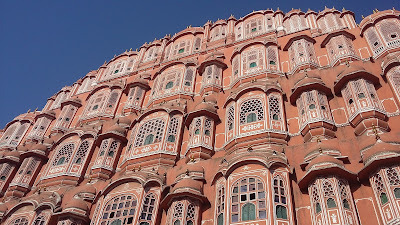 So our driver could find a spot close to Hawa Mahal for parking for a few minutes. We rushed out of the bus armed with cameras to get shots of the imposing structure. 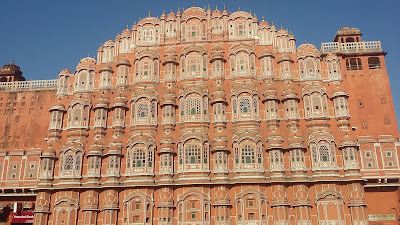 Some enthusiasts like me crossed the busy road to get a candid shot of the complete Hawa Mahal in our frame. What an exquisite structure! The top three floors of the structure have a dimension of one room width while the first and second floors have patios in front of them. The front elevation, as seen from the street, is like a honeycomb web of a beehive, built with small portholes. 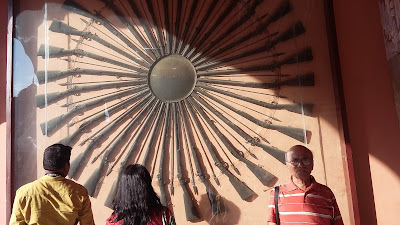 Each porthole has miniature windows and carved sandstone grills. Entry to the Hawa Mahal is not from the front but from a side road to the rear end. It felt great to feast our eyes on the actual monument which we had seen so many times in photos! It is particularly striking when viewed early in the morning, lit with the golden light of the sun. 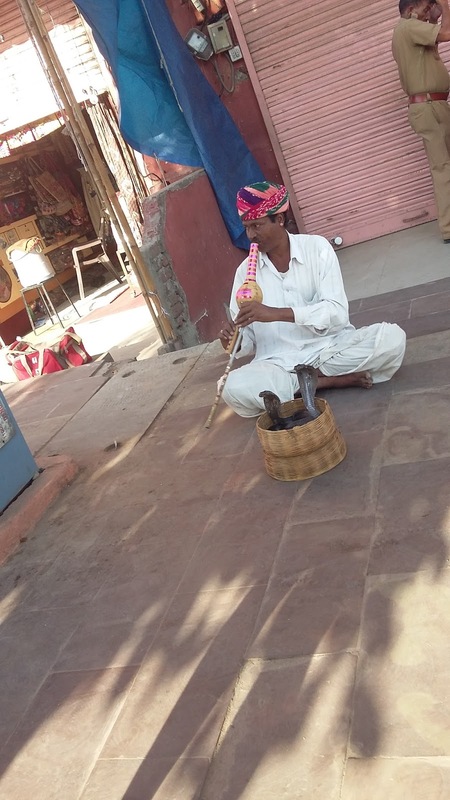 As I rushed back to get inside our coach, I didn't fail to notice the snake-charmer who failed to attract spectators who had eyes only for the pink monument. We then proceeded to Amer Mahal (UNESCO World Heritage Site) which welcomed us with its exotic grandeur. We didn't fail to notice foreign tourists enjoying the royal elephant ride. 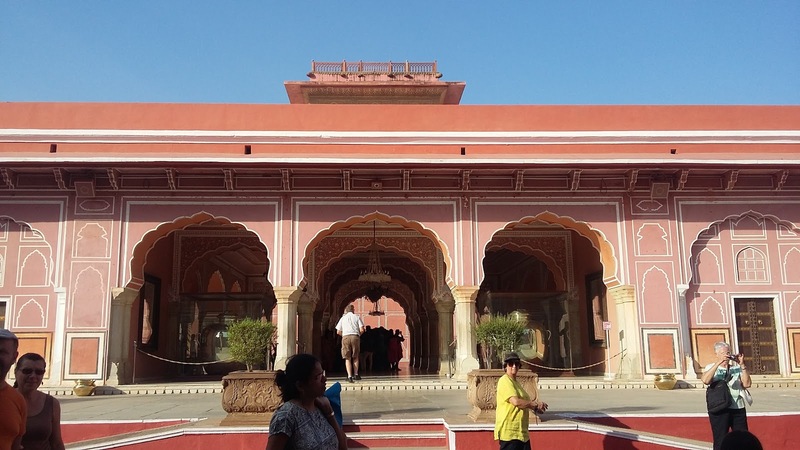 Constructed of red sandstone and marble, the attractive, opulent palace is laid out on four levels, each with a courtyard. 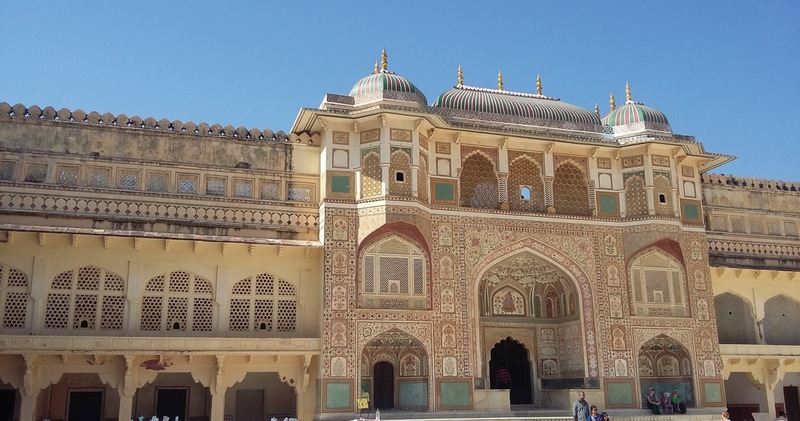 It consists of the Diwan-i-Aam, or "Hall of Public Audience", the Diwan-i-Khas, or "Hall of Private Audience", the Sheesh Mahal (mirror palace), or Jai Mandir, and the Sukh Niwas where a cool climate is artificially created by winds that blow over a water cascade within the palace. 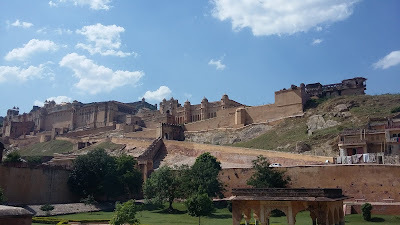 Hence, the Amer Fort is also popularly known as the Amer Palace, the residence of the Rajput Maharajas and their families. At the entrance to the palace near the fort is Ganesh Gate. 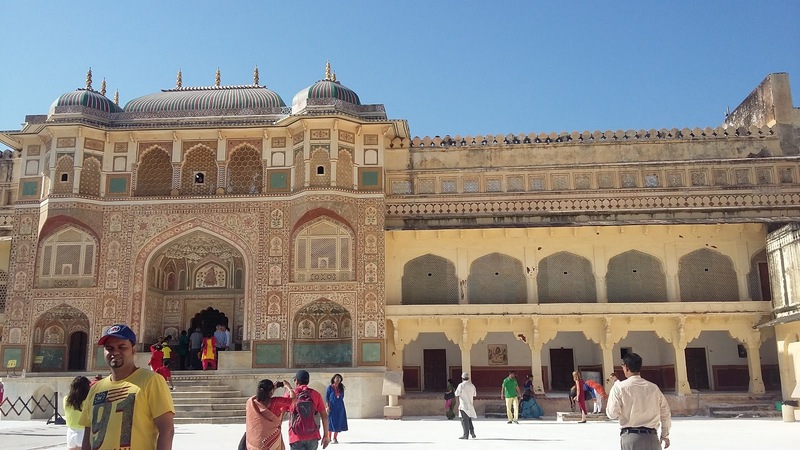 The Palace is divided into four main sections each with its own entry gate and courtyard. 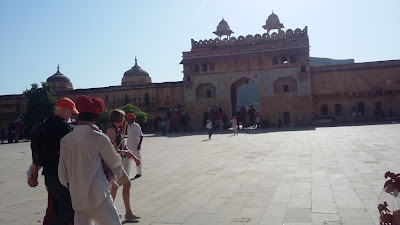 Main entry is through the Suraj Pol (Sun Gate - facing east) which leads to Jalebi Chowk, the first main courtyard. 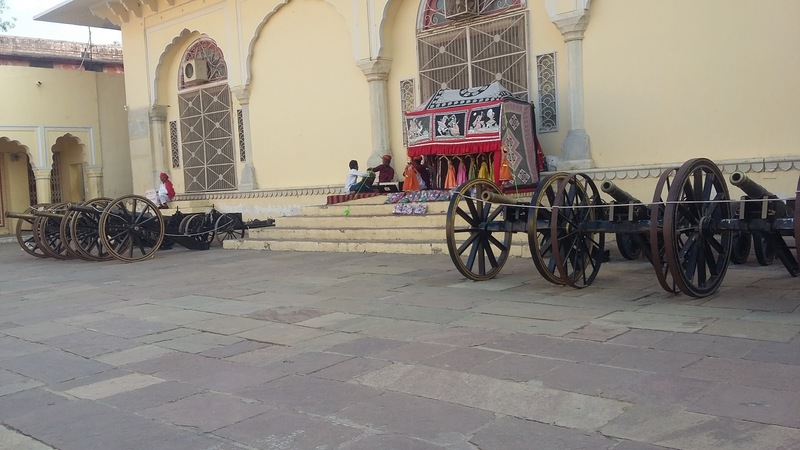 This was the place where armies would hold victory parades with their war bounty on their return from battles, which were also witnessed by the Royal family's women folk through the latticed windows. Adjacent to the courtyard were the horse stables, with the upper level rooms occupied by the guards. 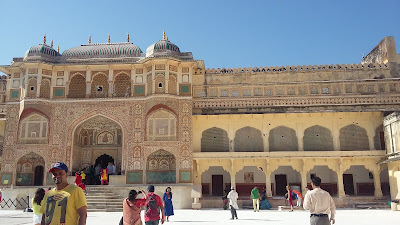 the second level courtyard, Diwan-i-Aam. It is a raised platform with 27 colonnades with a double row of columns, with galleries above it. As the name suggests, the Raja held audience here to hear and receive petitions from the public. 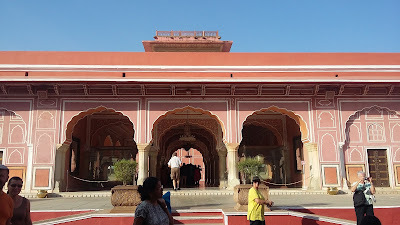 The third courtyard where the private quarters of the Maharaja and his family were located with two buildings separated by a garden designed like the Mughal Gardens. The building to the left is the Jai Mandir, which is exquisitely embellished with glass inlaid panels and multi-mirrored ceilings. The mirrors are of convex shape and designed with colored foil and paint which would glitter bright under candlelight. 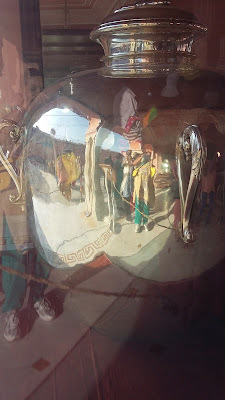 The intricate designs embedded with tiny mirrors were fascinating; we could imagine its glory at night during times of yore when the place was lit up with candles. Also known as Sheesh Mahal (mirror palace), the mirror mosaics and colored glasses were a "glittering jewel box in flickering candle light". 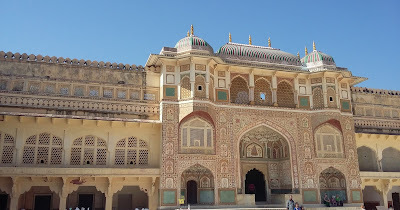 Sheesh mahal was built by king Man Singh in 16th century and completed in 1727. It has undergone restoration and renovation. 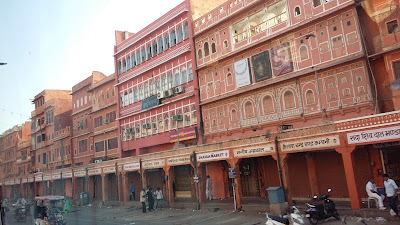 The other building on the right is the Sukh Mahal (Hall of Pleasure). This hall is approached through a sandalwood door with marble inlay work with perforations. A piped water supply flowing through an open channel that runs through this edifice acts as air cooler. The water from this channel flows into the garden. We could experience the coolness in this area. Jas Mandir, a hall of private audience with floral glass inlays and alabaster relief work, is also located in this courtyard. A particular attraction here is the "magic flower" carved marble panel at the base of one of the pillars around the mirror palace depicting two hovering butterflies; the flower has seven unique designs including a fish tail, lotus, hooded cobra, elephant trunk, lion's tail, cob of corn, and scorpion, each one of which is visible by a special way of partially hiding the panel with the hands. We could get a beautiful view of the lake too. We also got to see a bath tub used by the royal ladies. If you imagined it to be an ornamental one, it's not my fault - it is a tub made with stone and brick - now in a dilapidated state. The fact is the concept of bath tub was tried out centuries ago! The fourth courtyard is where the Zenana (Royal family women, including mistresses) lived. 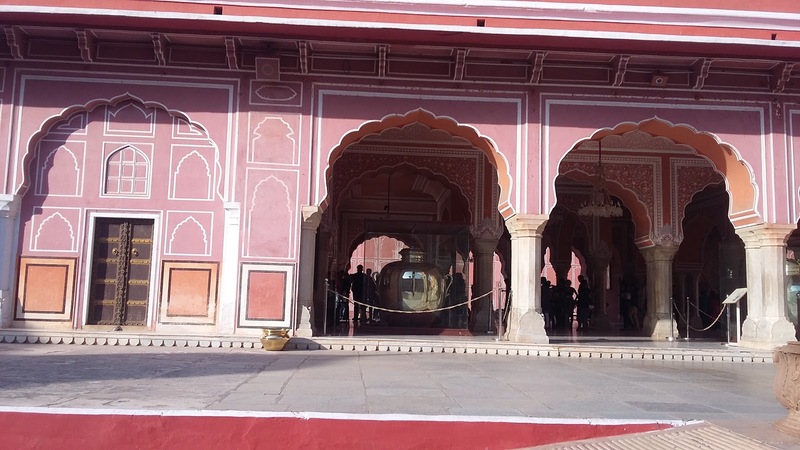 This courtyard has many living rooms where the queens resided and who were visited by the king at his choice without being found out as to which queen he was visiting, as all the rooms open into a common corridor. The view from the upper portions is breathtaking! As we were about to exit, we get to see the giant 'kadhai's (frying pans) used in those days. After spending an hour there, we went to the Handicrafts Emporium located nearby. We enjoyed a demo of block printing using natural colors. 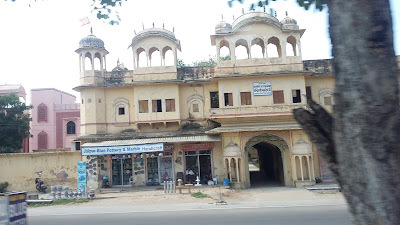 After that we went inside the one-stop-shop for Rajasthani handicrafts - from textiles to gems to paintings .... They had fixed prices - definitely on the higher side. But we were informed by our Tour Manager that the quality was genuine. So we finished most of our shopping there. The Jantar Mantar, a collection of nineteen architectural masonry, stone and brass astronomical instruments, was completed by the King Sawai Jai Singh in 1734 using astronomy and instrument design principles of ancient Hindu Sanskrit texts. It features the world's largest stone sundial, and is a UNESCO World Heritage site. The instruments mostly huge structures built so to increase their accuracy, allow the observation of astronomical positions with the naked eye. The monument expresses architectural innovations, as well as the blend of ideas from different religious and social beliefs in 18th century India. The monument features instruments operating in each of the three main classical celestial coordinate systems: the horizon-zenith local system, the equatorial system and the ecliptic system. The observatory consists of nineteen instruments for measuring time, predicting eclipses, tracking location of major stars as the earth orbits around the sun, ascertaining the declinations of planets, and determining the celestial altitudes and related ephemerides. 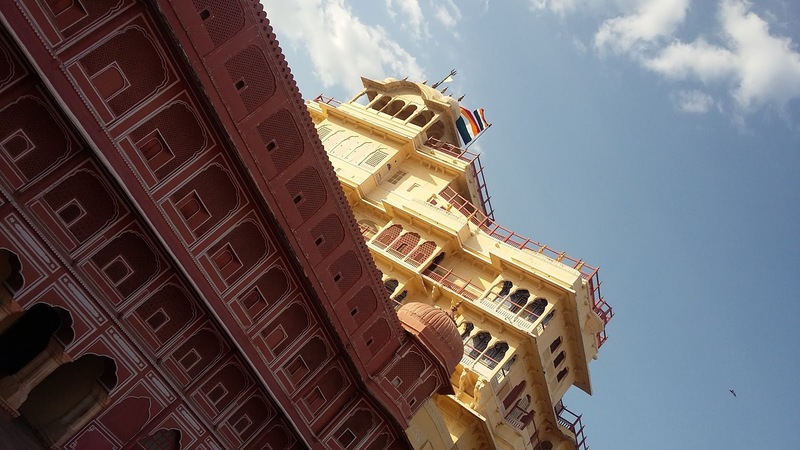 The Vrihat Samrat Yantra, which means the "great king of instruments", is 88 feet (27 m) high; its shadow tells the time of day. Its face is angled at 27 degrees, the latitude of Jaipur. The Hindu chhatri (small cupola) on top is used as a platform for announcing eclipses and the arrival of monsoons. 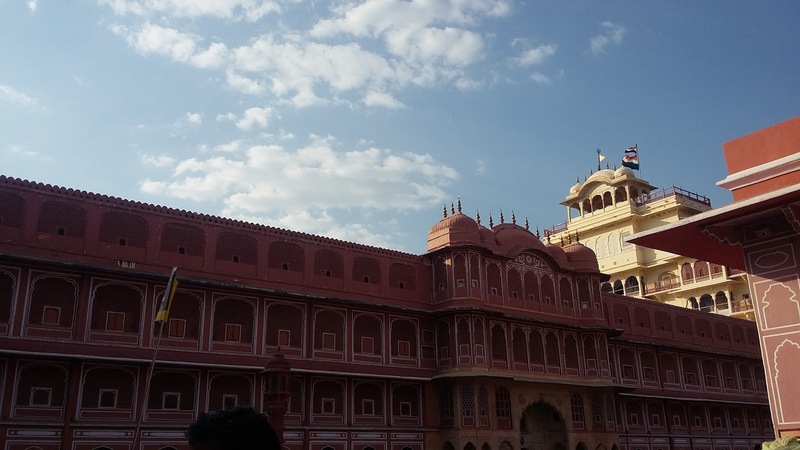 We then drove to City Palace, Jaipur, constructed during the rule of Maharaj Sawai Jaising II. The clock tower catches our eye. Then there is Chandra Mahal or Chandra Niwas, the most commanding building in the City Palace complex, with the flag of the royal family at its top. 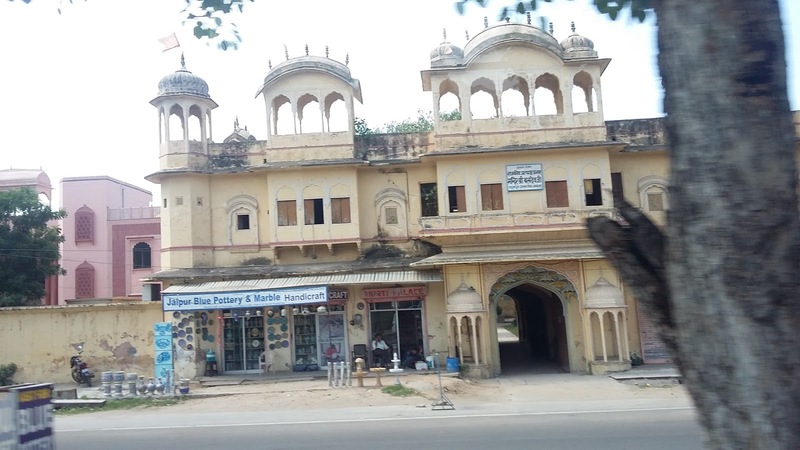 It is a seven-storeyed building and each floor has been given a specific name such as the Sukh-Niwas, Ranga-Mandir, Pitam-Niwas, Chabi-Niwas, Shri-Niwas and Mukut-Mandir or Mukut Mahal. 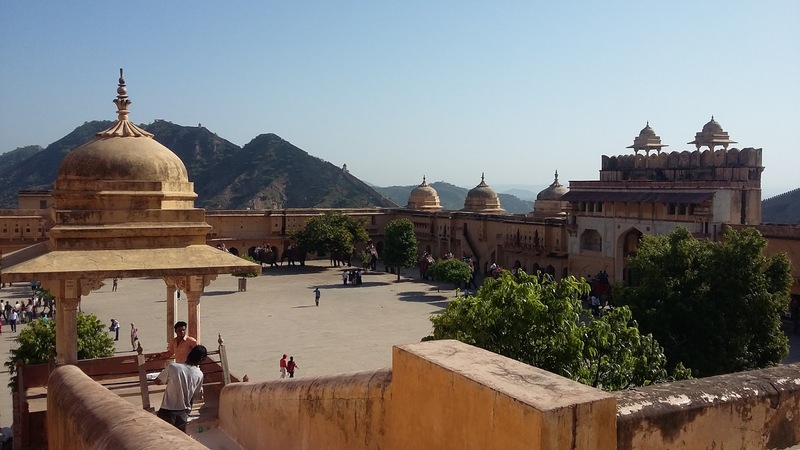 At present, most of this palace is the residence of the descendants of the former rulers of Jaipur. 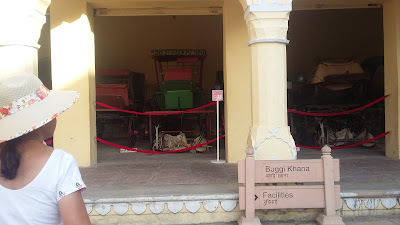 Only the ground floor is allowed for visitors where a museum is located that displays carpets, manuscripts and other items that belonged to the royal family. There is beautiful peacock gate at the entry to the Mahal. 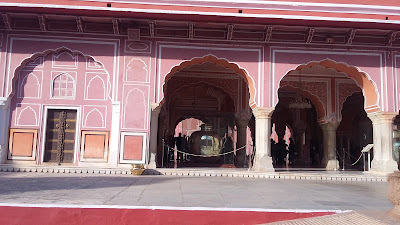 Diwan-i-Aam, the 'Hall of Public Audience', is a marble floored chamber. There are two huge sterling silver vessels of 5.2 ft height and each with capacity of 4000 liters and weighing 340 kilograms, on display here. They were made from 14,000 melted silver coins without soldering and they hold the Guinness World Record as the world's largest sterling silver vessels. 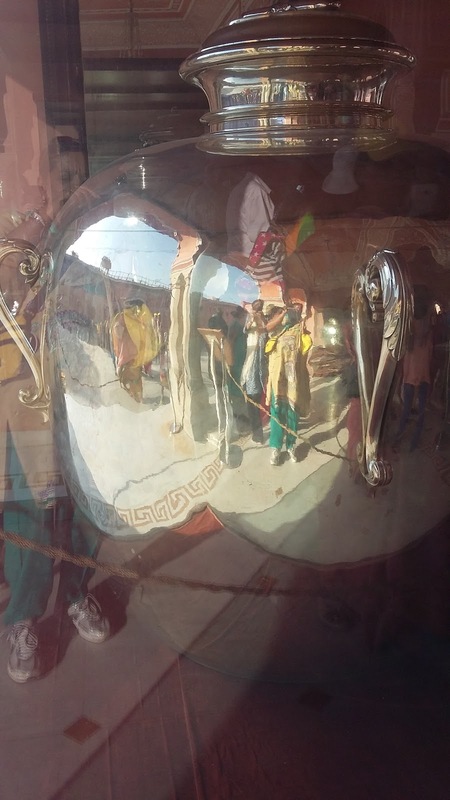 The interesting story is that these vessels were specially made by Maharaja Sawai Madho Singh II, a highly pious Hindu, to carry the water of the Ganges to drink on his trip to England in 1901 for Edward VII's coronation. Hence, the vessels are named as Gangajelies (Ganges-water urns). 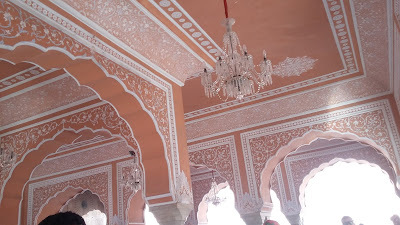 A number of crystal chandeliers adorn the ceiling (normally covered with plastic sheets to prevent dust collection), which are uncovered on special occasions. 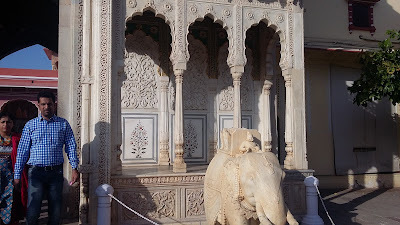 At the entry gateway to the 'Diwan-E-Khas' (Sabha Niwas) or the 'Hall of Private Audience', two large elephants, each made out of single marble rock are on display. This enchantingly vibrant chamber, with the ceiling painted in rich red and gold colors now functions as an art gallery, housing exhibits of exquisite miniature paintings, ancient texts, embroidered rugs, Kashmir shawls and carpets. A special exhibit is the Royal throne. The ceiling of this chamber has unique frescoes. Bhaggi Khana is a museum in the palace complex with an exhibit of a collection of old carriages, palanquins and European cabs adapted as baggis. The baggi which attracts attention is the one gifted by Prince of Wales to the Maharaja in 1876, called the Victoria baggi. Around 5.30 pm, we were dropped at Bapu Bazar to spend some time and money shopping - which we gleefully did. And we enjoyed the experience as we could indulge in our favorite activity of bargaining effectively - well, both parties - the buyer and the seller gloat over their skill at striking a deal. Anyway since everyone is happy, there is no loser! 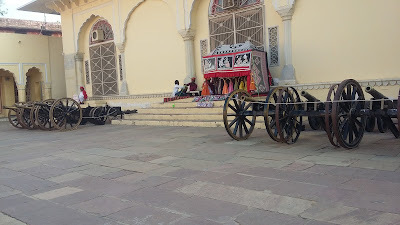 So Jaipur crockery, bedsheets, ghagras, sling bags, stoles, comforters, footwear ... found their way to our luggage! 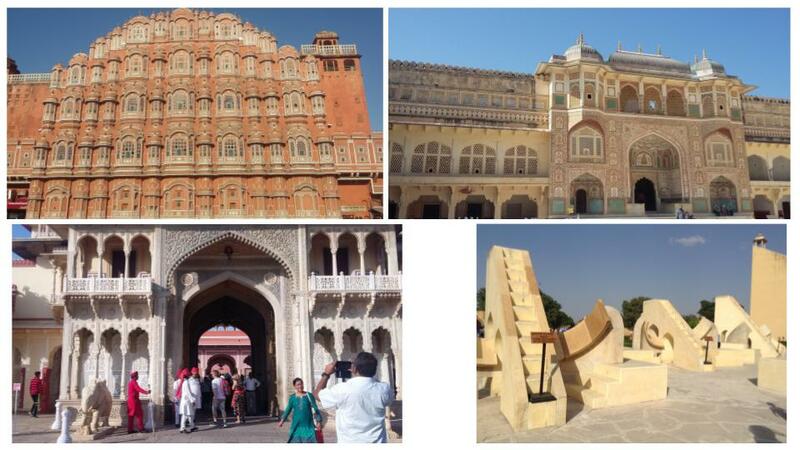 Next morning we bid our goodbye to royal and regal Rajasthan for hosting us for seven days and providing us with fantastic historical experiences, visual treats, delectable cuisine to tingle our palates and multifarious modes of transport as well as vividly distinct places. 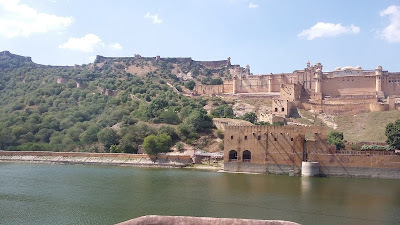 Rajasthan is not a dream-walk. So head for it when you have the health, spirit and stamina if you desire a complete experience. 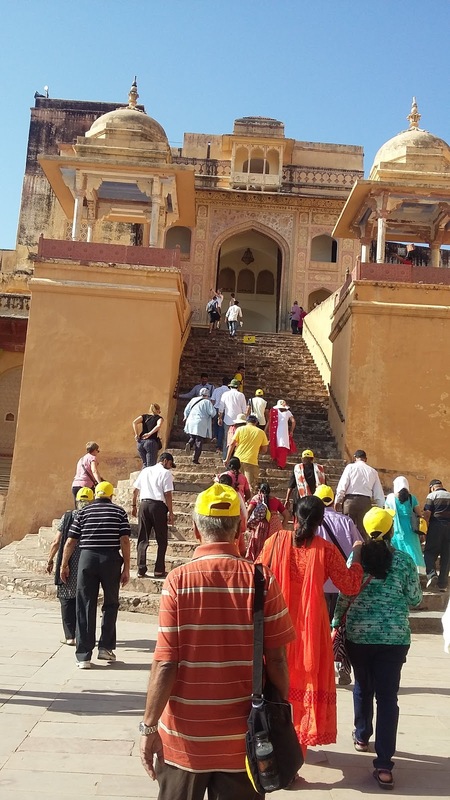 Touritor offers best deal tour packages and tour guide to visit Jaipur. Wonderful, what a blog it is! This webpage provides useful data to us, keep it up. 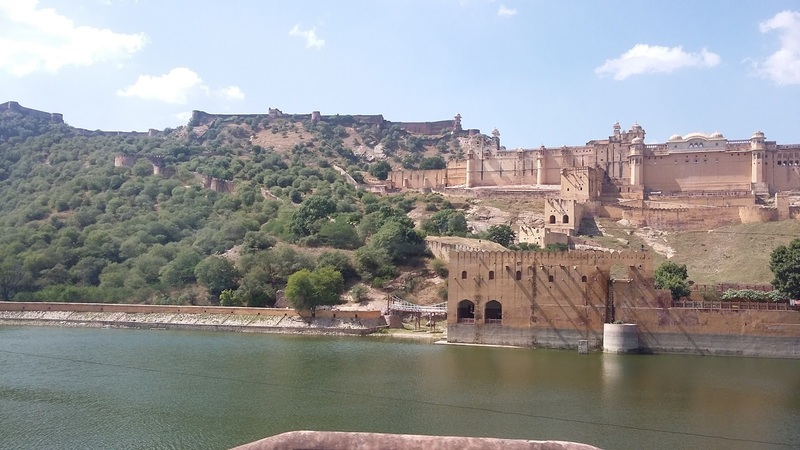 this post provide information about Best Rajasthan Tour Packages. if you take a tour of rajasthan. contact us.